Normally I’m not one to use pre-made or packaged foods, however every so often having emergency go to food that’s fast and easy is a life saver. Recently I received several internationally inspired pastas by Monterey Gourmet Foods to try and so I put them in my freezer knowing I’d find the perfect opportunity to give them a try. Sure enough I found myself in a situation where I needed to make dinner, had very little in the refrigerator and didn’t have time to run to the store. Monterey Gourmet Foods to the rescue! With three options to choose from – Spinach & Cheese Ravioli, Five Cheese Ravioli, and Potato & Cheese Pierogi – I did a quick inventory of ingredients I had on hand that I could use to toss with my dish. I had a green apple, and walnuts plus some chives for garnish. 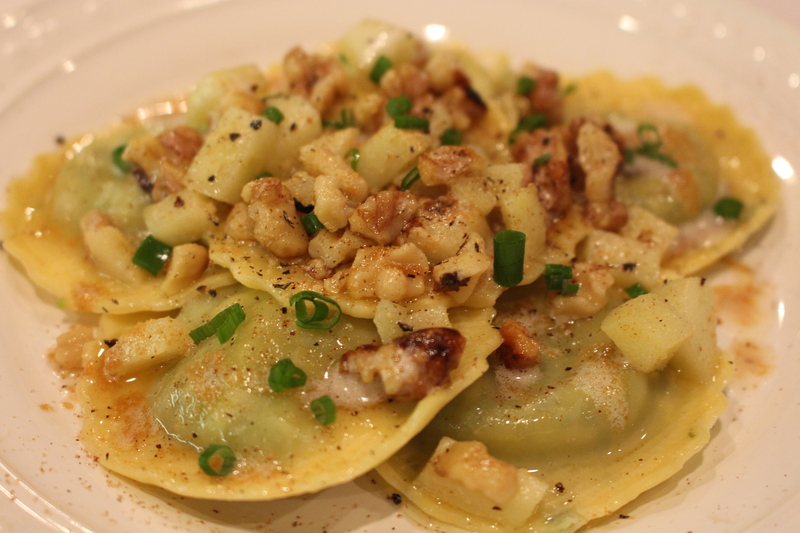 The green apple made me think of spinach salad so I went with the Spinach & Cheese Ravioli. I had this dish prepared in about 20 minutes or so! 1. Bring a large pot of well-salted water to boil and have strainer ready in sink. Once water boils, add ravioli straight from package, no need to thaw and cook according to package instructions. Drain in colander when done to prevent sticking toss a little melted butter or oil on them. 2. While water is coming to boil toast walnuts in dry pan over medium low heat. This will just take a few minutes. 3. Dice green apple with skin on while walnuts toast. 4. Once walnuts are toasted, remove set aside and wipe pan clean. 5. Add butter to the pan on medium low heat and allow to brown slightly adding in apples and walnuts. Toss for a minute or two until apples are warmed and add cooked raviolis to pan. Toss for a minute or so and grate nutmeg on top. 6. Arrange raviolis on plate and top with apple and walnut mixture. Sprinkle with a few chopped chives or scallions. Add fresh ground pepper and grated parmesan on top if desired. Serve. Monterey Gourmet Foods pasta comes packaged fresh, but if you don’t plan on cooking it right away, they freeze well and go straight from the freezer to the frying pan or boiling water. How convenient! For recipe ideas check their website or let your imagination run free.